What a fantastic 3 days spent at Sywell for the this year’s UK Aero Expo (May 30 – June 1). Designed specifically for pilots, Bigatmo’s sunglasses felt very much at home in the fabulous setting of Sywell Aerodrome, where we met like-minded people and businesses, and soaked up the buzzing atmosphere. This is our 3rd year running to have a stand at Aero Expo, where pilots descend on a show bursting with the latest technologies, aircrafts, fashion and more. Despite the weather not playing ball all the time, we were rushed off our feet on the Bigatmo stand. Many more pilots are now wearing Bigatmo sunglasses, including a Canadian who dropped in to the show! As the sunglasses are designed for pilots, they can stand up to other challenging environments too. Fishing and motor racing were some other pursuits of new customers who chose Bigatmo sunglasses at Aero Expo. 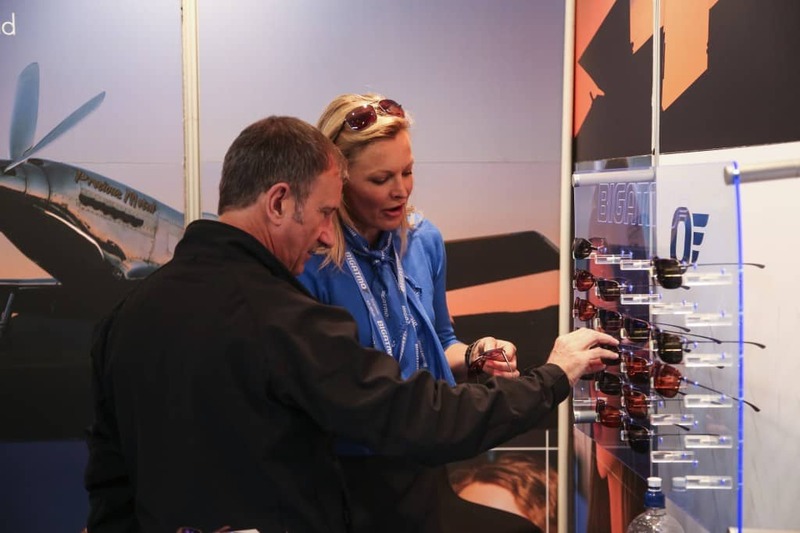 What a massive boost it is to meet new and past customers face to face at the show, who feed back so positively about the sunglasses. We are also very lucky to have built many great relationships with other connections in the aviation industry, not least Team Yakovlevs aerobatics display team who also helped man the stand, and humour it too. Paddy and Alex, the organisers of Aero Expo always make Bigatmo feel very welcome and it was a pleasure to support the show even more this year and sponsor the lanyards which all exhibitors wore. Old and new connections are very supportive of Bigatmo and since Aero Expo we have several more pilot connections who will be selling Bigatmo sunglasses on our behalf. Bigatmo sunglasses also featured in the Aero Expo fashion show, where the models wore the latest aviation clothing as well the best aviation eyewear! Thank you to the models, organisers and to photographer Luke (www.lukefullalove.co.uk) for involving us.